Evotips are essentially miniature, disposable trap-columns. Samples are loaded onto Evotips for de-salting and cleaning prior to analysis on the Evosep One system. The loading and cleaning steps are thus done off-line and may be automated or done in parallel with multi-channel pipettes. Sample preparation is therfore extremely fast. De-salting on disposable tips has become common practice for sample preparation prior to nano-flow LC-MS. 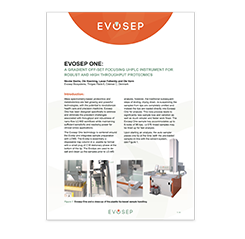 But when using the Evosep One, the steps of manually eluting samples, drying them down, and resuspending them are completely omitted. 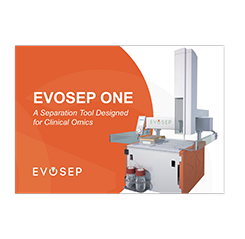 The racks of rinsed tips are simply placed on top of the Evosep One which elutes the samples from each tip and runs the separation in one integrated procedure. 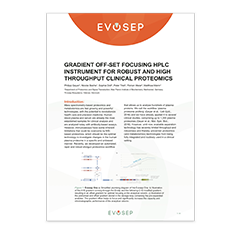 This approach saves time and avoids the perils of drying down low-level samples. But most importantly, each tip is eluted using “Partial Elution” that only runs the gradient up to a certain strength where contaminants such as polymers and large biomolecules remain on the tip, along with any particulate matter of the sample. This means the separation column will continue working, sample after sample, and it is the primary contribution to making the Evosep One 100 times more robust than any other nano-flow separation system. 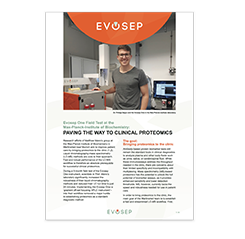 Evotips are manufactured by Evosep with extraordinary focus on obtaining a high and reproducible quality. All materials have been selected for the particular purpose and the manufacturing process itself is tightly controlled as is the final product. Evotips are sold in racks of 96 tips. You can order as little as one rack of tips from us, but more likely you would want to order 10 racks, 50 racks or 100 racks at a time. The Evosep One sample tray accommodates up to 6 racks of Evotips at a time.